With just weeks to go before the opening of the Grenada Pavilion at the Biennale di Venezia, the evening of Saturday, 30 March showed a surge of interest for support of the pavilion. The cocktail held at the beautiful villa Tamarind House, home of Pamela and Bill McGuiness, was a smashing success for fundraising for the Grenada Pavilion in Venice. An art auction was organised, with the Grenada Arts Council asking the artists who have shown in the previous pavilions in 2015 and 2017 to donate works of art. Oliver Benoit, Maria McClafferty, Susan Mains, Asher Mains, Milton Williams and 2019 artist Billy Gerard Frank provided the stellar lineup. Auctioneer Dr Ameche also donated his time and provided a rousing, lively auction to the eager patrons. Even Minister of Culture, Norland Cox, jumped into the fray and won the bid of a painting by multi-media artist, Billy Gerard Frank. Of note is that Minister Cox hails from Carriacou, the big sister island to Petit Martinique where Billy is originally from. Most significant was the speech of Minister Cox, who promised support for the Grenada Pavilion from the Ministry of Culture and Government of Grenada. This is a great stride forward, because it confirms the belief that art is a great driver for our local economy. 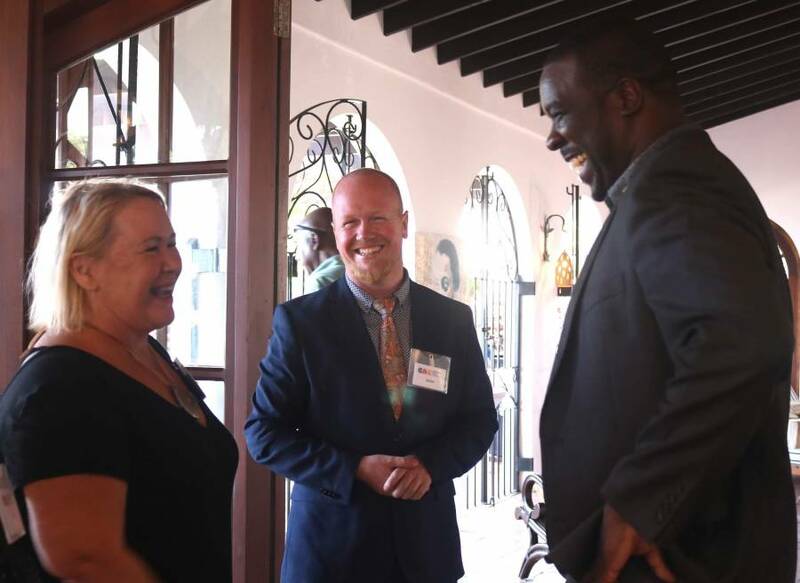 President of the Grenada Arts Council, Asher Mains, spoke about the power of the Antilles, and the very unique civilisation in which Grenada thrives. “Epic Memory” is the theme of the pavilion and is inspired by the work of the late Derek Walcott. The Grenada pavilion in Venice will open 8 May and continue through 24 November. It is a long period in the beautiful city of Venice, Italy, and will attract thousands of visitors. Many of these visitors will be exposed to Grenada for the first time, and the hope is that our art will draw them to us and result in a visit to the island. Grenada’s participation in Venice has been made possible by the Italian non-profit group, Start SRL, and our curator Daniele Radini Tedeschi. Commissioner of the Grenada Pavilion, Dr Susan Mains, repeated her often used quote, “We only have each other.” In this case, “each other” provided the push that was needed to provide much-needed funds to make the Grenada Pavilion a huge success. Smiles all around.